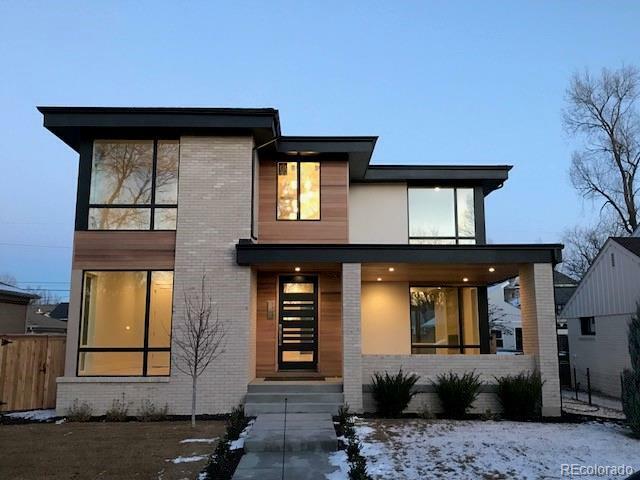 New Contemporary home in Cory-Merrill neighborhood with bright, open floor plan. Beautiful kitchen with custom alder cabinets, professional grade Kitchen Aid Appliances and quartz countertops. High end finishes including custom front door, concrete board form fireplace surround, 5" white oak flooring, 8ft tall windows. Front door, barn door to study, handrail and staircase all custom milled by local millwork studio. Open finished basement includes large Family Room, Exercise/Play Area, 2 Bedrooms, Full Bathroom and large storage room. Outdoor living spaces include covered dining off the kitchen and dining room, large back patio with fire pit and oversized covered front porch. Home built by award winning builder with 22 years of custom home building experience in Denver.